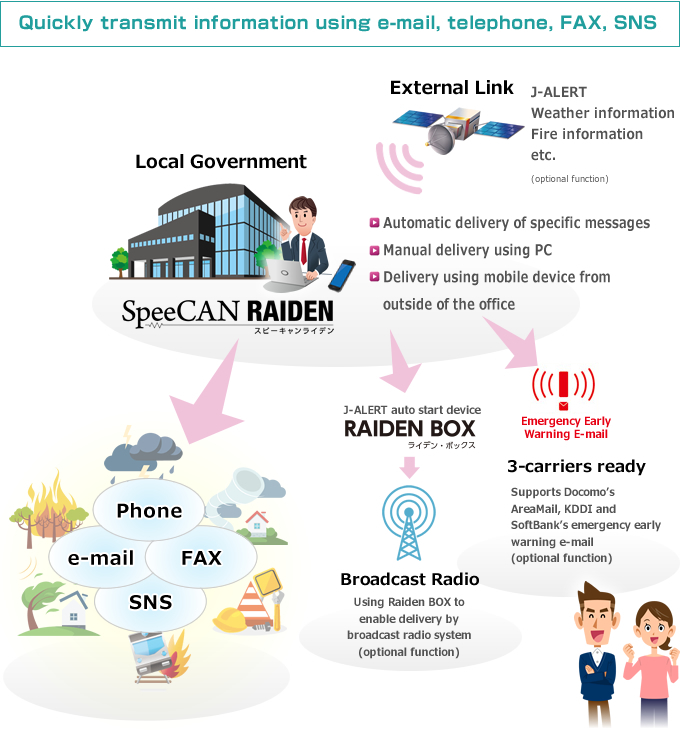 SpeeCAN RAIDEN is an Internet service for simultaneous broadcast, equipped with Arcadia’s speech synthesis software SpeeCAN. By just entering the message to be sent/broadcast from the Internet browser, the message is then delivered as e-mail, voice-synthesized then transmitted as phone call, transmitted as FAX, and also as SNS status update, all automatically, operated centrally using a web-browser. It is also possible to link with weather information and J-ALERT signal. Furthermore, automatic message delivery is provided not only for e-mail and telephone, but also for disaster prevention administrative radio and emergency early warning e-mail. * Provided as an optional function. Cost will vary depending on the number of e-mail addresses. Also, phone call / FAX require separate communication costs. We have many available options such as J-ALERT, weather information, emergency early warning e-mail (NTT Docomo’s AreaMail), telephone service, and so on. Please contact us for more information. [Note] “AreaMail” is a registered trademark of NTT Docomo. * This service is provided as an Internet service. * Special device, hardware, software are not required.